The card is available to male and female members of affiliated Clubs that have registered their participation in the scheme, thus encouraging golfers to seek membership of those Clubs that offer the card. Similar schemes are already in operation in most Counties and have proved greatly beneficial to affiliated Clubs, both in terms of visitor numbers and the retention of members. Since its inception just over five years ago, the scheme has gone national with about 1,350 clubs throughout England taking part. How does the scheme work for Clubs? County Cards may only be sold to members of participating Clubs, which have agreed to accept card holders in return. Clubs are completely free to impose restrictions on visitor numbers and times, including periods of the year, and to set the discounted rate which will be used. Club Members are not compelled to purchase a card. Cards will be valid for 12 months. Clubs may buy cards in bulk for members, [at a discounted rate] using the 2019 Bulk Purchase form. Alternatively, cards can be purchased for named members, using the 2019 Player application form, which should be submitted with the names of their members who wish to purchase cards. Clubs can make payments either by cheque [payable to “Y.U.G.C.”] or by BACS. How does the scheme work for members? Exclusively available to members of participating Clubs, only via their Secretary/Manager. Members will be supplied with a COUNTY CARD, at the current rate [see below] unless their Club has made a bulk purchase. The Card covers the period 1st April to 31st March. Members use their card to obtain discounted Green Fees as set by the host Club. 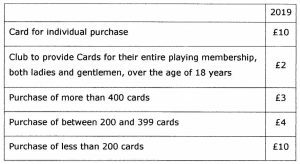 Cards may only be used once at each Club, and are not valid for groups of more than four players. Tee times must be by prior arrangement with the host Club. How much does a card cost? How do you get a card? Clubs need to register as participating, by completing a Club Registration form. 2019 player application form to buy for one or more, but not all, members. Individual members need to get a 2019 player application form completed, and then signed by a Club official. If you need a card for the remaining part of the 2018 card year [up to 31st March 2019], please contact the County Card Administrator. The affairs of the scheme shall be conducted and managed by The Yorkshire Union of Golf Clubs which shall have the power to make rules and to vary such rules from time to time as may seem expedient through the Executive Committee of the Union. Any surplus income of the scheme shall belong and be paid to The Yorkshire Union of Golf Clubs. 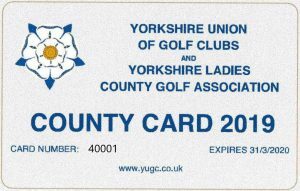 The surplus income derived from cards purchased by ladies will be passed on, in full, to The Yorkshire Ladies County Golf Association. in possession of a CONGU Handicap and aged 18 or over. Social, House and Non-Playing Members of such Clubs are not eligible for membership. The Card Fee is £10 per annum, or such other sum as may from time to time be set by the Union. The Scheme’s year is from 1st April to 31st March. Application for membership must be made through the Club Secretary/Manager who will forward it, together with the subscription, to the County Card Administrator. Please read carefully below the Rules of the County Card Scheme. The Card may only be accepted once per Club in any one year. The Card is non-transferable and for the sole use of the signatory. The Card must only be used by a current member of a Club affiliated to YUGC and must be completed and signed by the cardholder before use. To avoid disappointment, all cardholders MUST contact the Club they wish to visit prior to arrival, and tee times booked in advance wherever possible. All players MUST adhere to each individual Clubs guidelines relating to etiquette, dress code and local rules. This Card may not be accepted for groups larger than four. Any misuse of the Card may be reported directly to the card holder’s home Club. The 2018 Card is valid from 01/04/18 and expires on 31/03/19. The 2019 Card is valid from 01/04/19 and expires on 31/03/20. Enforcement of the rules is at the sole discretion of each individual Golf Club. Promoting Amateur Golf across Yorkshire. Yorkshire Union of Golf Clubs © 2019.